In Paris, a woman crosses the snowy bridge of the Concorde. A snowstorm hit the city of Paris on 18, 19 and 20 January 2013. On the Concorde bridge, a woman is walking on the sidewalk covered with snow. In the distance, a man rides on the snow with his unicycle. Une tempête de neige s’est abattue sur la ville de Paris les 18, 19 et 20 janvier 2013. 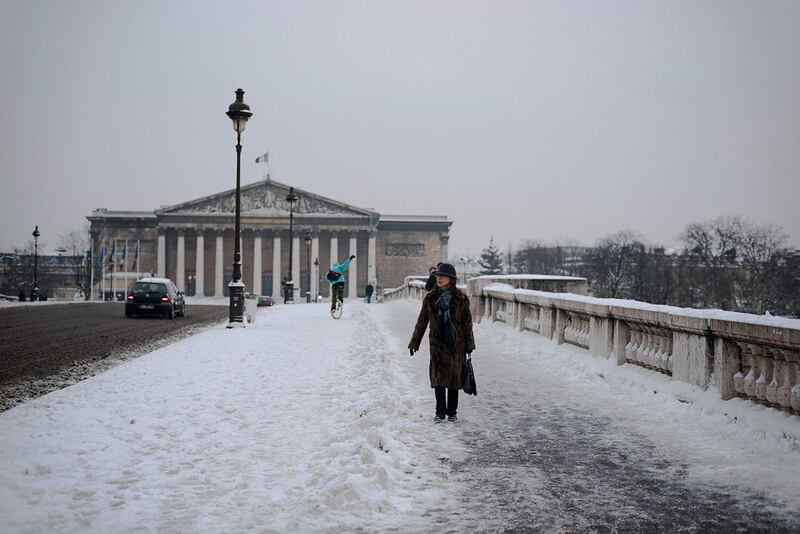 Sur le pont de la Concorde, une femme marche sur le trottoir couvert de neige. Au loin, un homme roule sur la neige avec son monocycle.